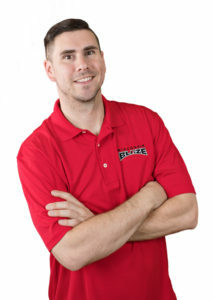 Andy Bauer is a girls basketball coach for Wisconsin Blaze. A native of Oshkosh, WI, Andy played basketball at Oshkosh North High School. He earned the Fox Valley Association All-Conference honorable mention honor. Upon graduating from high school, Andy attended Fox Valley Technical College. He graduated with a degree in Accounting. Andy has coached youth basketball with the Oshkosh North Hoops Club since 2011 and is in his second year coaching with Wisconsin Blaze. His coaching philosophy is to work hard and succeed together as a family while having fun along the way. In his words, “My focus is on creating better humans & teammates, not just better basketball players. We will work for the future and not just worry about earning trophies today.” Andy coaches his teams to play an up-tempo and attacking offense with a grind-it-out tough defense. He likes to see his teams play with confidence and swagger. When he’s not coaching, Andy works as a Trade Sales Consultant at Pella Windows & Doors of Wisconsin. Andy has been married for 14 years to Rachael and they have three children Dominique (13), Arianna (10) and Olivia (9), plus a dog named, Stitch. We are so happy to have Andy coaching our Blaze basketball teams!